There are many holidays I love to host. Thanksgiving? Not so much. The entire menu is set. Try having a Thanksgiving without Turkey. Stuffing. Mashed Potatoes. No go. Not happening. Entire episodes of comedy shows have been dedicated to the very idea of messing with the classic dishes. What makes the episodes funny is the absurdity. Serve salmon at Thanksgiving? Certainly not. Venison? Egads, no! Fail to provide a pumpkin pie? A blog post detailing that faux paus alone could go viral. Despite the fact that game, seafood and different poultry were very likely part of the cuisine in early New England, and no one had likely made a pumpkin pie at that point, the menu is written in stone. Do not deviate or you will be mocked. So, what can I add to your repetoire? How about actual cranberry sauce. Sure, cranberry sauce doesn’t make an appearance until much later in the American cooking repetoire. Sugar was expensive and scare in the early colonial times. But it is arguably a staple in the American Thanksgiving experience. I know what you are thinking, you have no time. People love to glop out that stuff that comes in a can. You are already overcommitted making items. Well, this can be made days in advance and takes less than 15 minutes. Honestly, I had no idea it was as easy as it was to make this dish. And truthfully, it’s never been my favorite, until it was forced on me in a sandwich. I didn’t know it was on the sandwich until I bit into it. I had to admit, it worked with the turkey and gravy and tasted good. Is this a fussy dish? Nope, one pot. And how many ingredients? 4. Ok, 5 if you count orange zest and orange juice separately. 6 if you add a splash of port. Fine 7, if you count water. 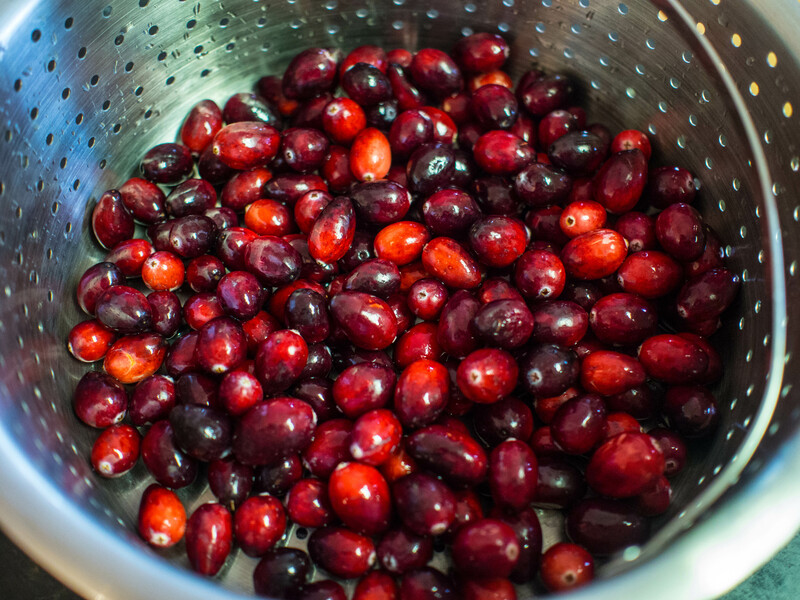 Although, you could make this recipe with just water, cranberries and sugar. If you try this and think it’s too tart, feel free to add more sugar. This is not a recipe you can’t alter. Also, for the liquid, use whatever proportion of liquid you have, as long as the total liquid is 1 cup, you should be fine. I took a liquid measuring cup and juiced my orange, added a splash of port and enough water to equal one cup. The port is strictly optional. I happened to have a bottle open. I would not buy a bottle for this recipe. In a heavy bottomed 4 quart sauce pan, bring sugar and liquids to a boil over medium heat. Add cinnamon stick. Simmer until sugar is dissolved. Add cranberries and orange zest and cook until berries pop and sauce thickens, about 10-15 minutes. 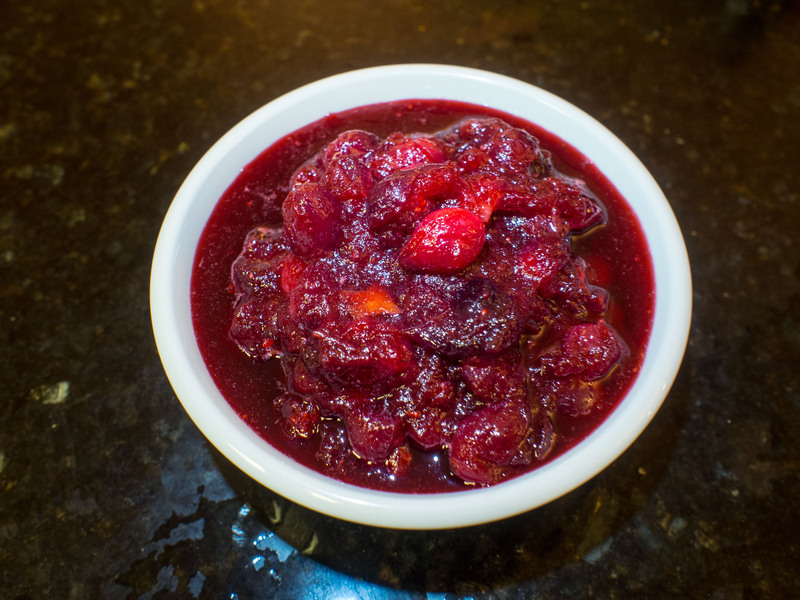 This entry was posted in Sides and tagged Cranberry Sauce, easy, Gluten Free, Orange, side dish, thanksgiving on November 26, 2014 by dawn of food. As I mentioned in my post on stuffing, I love Thanksgiving. It’s a food extravaganza. People aren’t shy about carbing it up. Stuffings, breads, pies, and potatoes of all varieties grace the table. 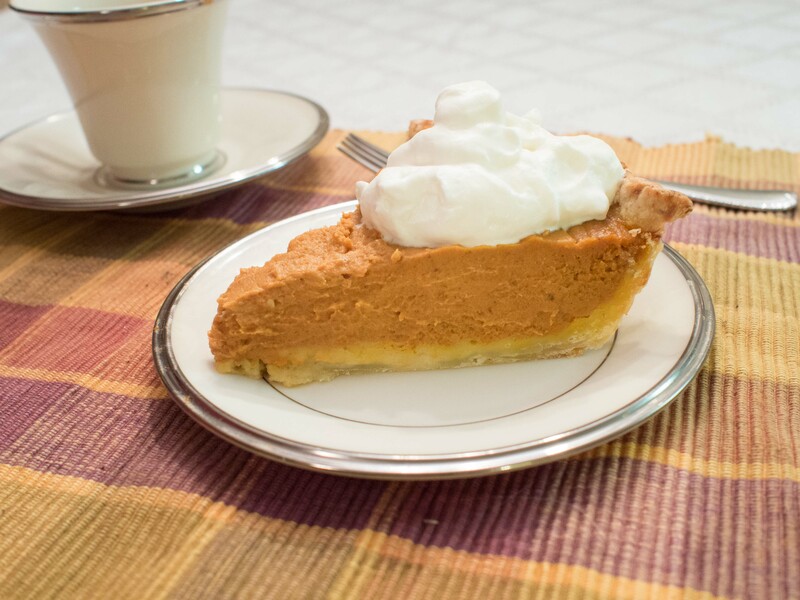 Unfortunately, most of the time, pumpkin pies are either bought from the supermarket bakery or reheated from frozen. Sad. Why? Because the hardest part of a pumpkin pie is deciding when it’s finished in the oven. It’s a dump and bake proposition, otherwise. Most people will make the Libby’s recipe for pumpkin pie on the back of the can of canned pumpkin. While it’s perfectly fine, that’s kind of the problem, it’s fine. I discovered this other pumpkin pie recipe several years ago and just found it to be so superior to the Libby’s version, I had to try it. It’s from the New York Times Cookbook (the Craig Claiborne version). First, it had cream. Real, heavy, cream. NOT evaporated milk. It had me at cream, really. Then it had 3 cups of canned pumpkin, which is a LOT more than one 15 ounce can. I was intrigued. If you are familiar with the New York Times Cookbooks, there are no pictures, you are on your own. I tried it and it changed our family’s pumpkin pies forever. 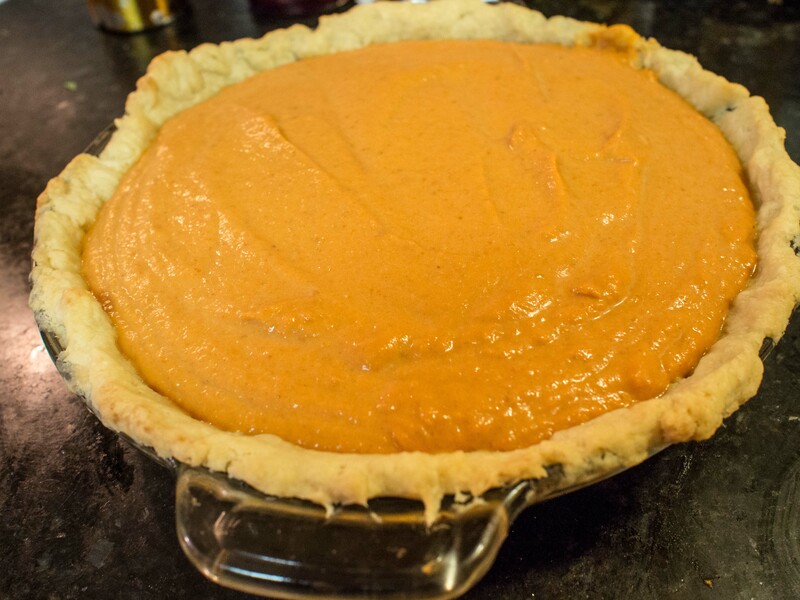 This is a rich pie with lots of creamy pumpkin flavor, not wan or thin. It’s truly amazing. Many people who didn’t like pumpkin pies, like this version. This recipe just cannot be easier, for the amazing dessert you end up presenting. Get a store bought crust (I prefer the frozen ones to the refrigerated roll out kind), and it’s super easy. I like making my own crust, which presents a variety of challenges, all of which end up in deliciousness. Now, the hard part: when is the pie done. Generally speaking, it’s done when the center jiggles just a little. Helpful, no? How much is a little? When is a jiggle? Why has my pie cracked open? I avoid these issues with a low temperature baking. This varies from Claiborne’s instructions. If I follow his instructions, it comes out pretty cracked and sort of not done in the center. Could be my oven. If using a homemade crust, roll out crust and place into pie dish. Prick holes in the crust all around with a fork to prevent bubbles. Add pie weights. Blind bake (bake with no batter) the crust for 10 minutes at 450. Remove the weights and reduce heat to 375 and bake for another 10 minutes. Remove from oven and set aside. Combine remaining ingredients in a mixing bowl. Blend well over medium speed. Pour the mixture into the prepared pie shell and place in the oven. Bake for 15 minutes. Reduce heat to 325 degrees Fahrenheit. Check crust for signs of browning, if brown, cover. Bake for 45-55 minutes more, or until the center is just slightly jiggles when the pie is slightly jostled. You may want to check often after the 40 minute mark, as oven temperatures vary. Cool and serve. This entry was posted in Dessert, Holiday Recipe and tagged Craig Claiborne, dessert, easy Thanksgiving Dessert, Libby, New York Times Cookbook, pie, Pumpkin, Pumpkin Cream Pie, Pumpkin pie, thanksgiving on November 23, 2013 by dawn of food. Yes, you can make stuffing with no bread and have it look this awesome! There are few holidays that really excite me food-wise as Thanksgiving. First of all, you have the tradition. You can go full bore and serve exactly what the pilgrims ate, or you can do the modern classical Thanksgiving: Turkey, stuffing, various potatoes, token green veg, rolls and pumpkin pie. It’s a virtual carbohydrate bonanza! Over the years, however, various dietary needs have arisen and several beloved family members have been diagnosed with diabetes. The traditional Thanksgiving meal is a disaster for your typical diabetic. Instead of “going without”, I am all about making something equally good from more low carb friendly fare. 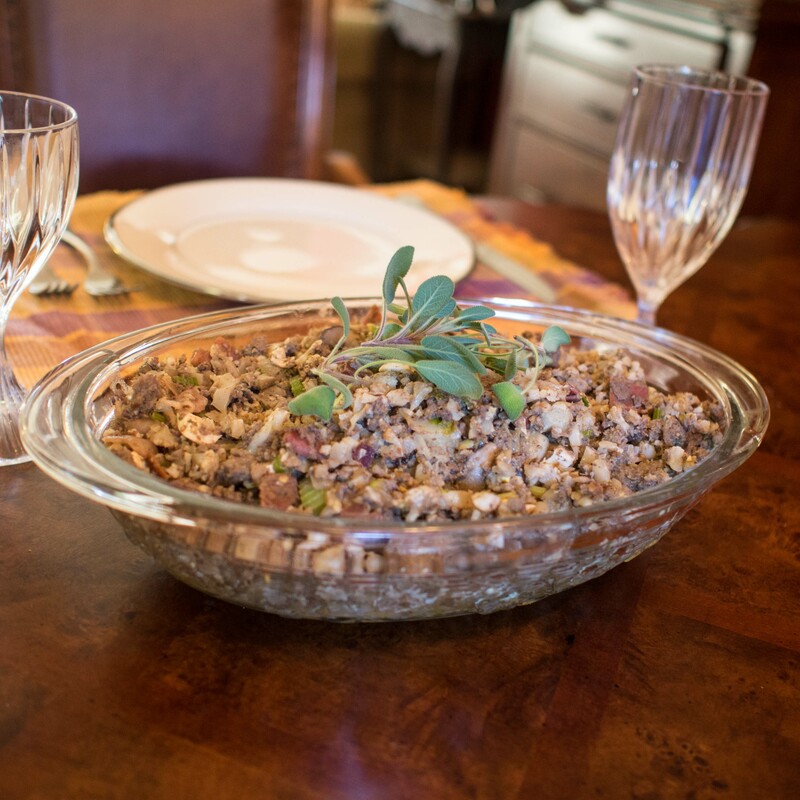 My most favorite dish on the Thanksgiving table is stuffing. As a kid, there was nothing better than the box of Stove Top Stuffing, amended with sausage and mushrooms and placed on the table. Nothing. Sure, I can laugh now, but back then, you angled to get a seat by the stuffing. 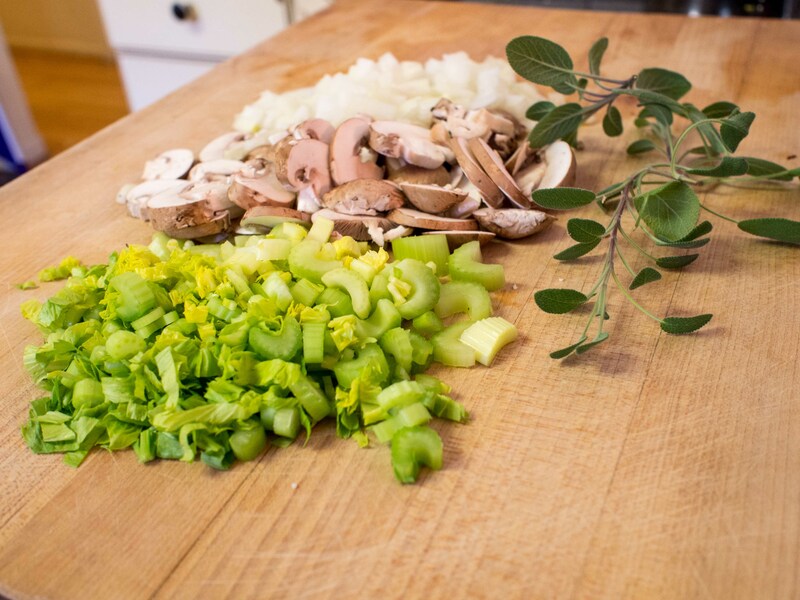 Stuffing by its very nature, however, is a high carb endeavor. So, I started looking at all the stuffings from the yesteryear for inspiration. Stuffings with sage or chestnuts or oysters! Oh my! So much to try. So I stumbled upon the recipe below quite by accident. I wanted a touch of richness, a bit of history, and a whole bunch of easy. 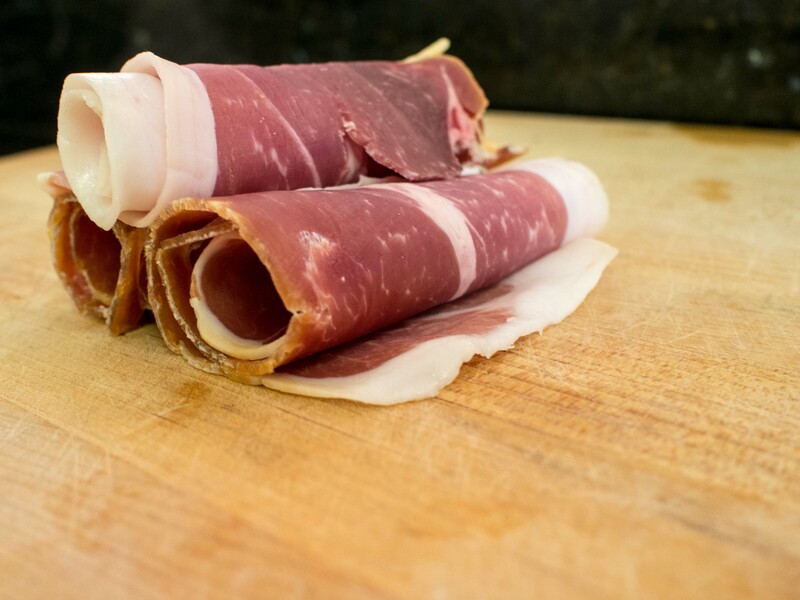 One of my go to ingredients when I’m looking for rich and clearly special is Prosciutto di Parma. It gives a fantastic, complex, flavor without the excess, and rather random amount of fat and smoke that bacon brings. Initially, I came up with a stuffing with sausage, chicken livers, oysters, prosciutto di parma, seasonings and bread crumbs. There wasn’t a single drop of stuffing left. Everyone ate every last bit and wanted more. However, the carb count was likely crazy high. So, I had to turn my focus to the low carb version. Then, I got an assignment that asked me to concentrate on gluten free cooking that included the amazing Prosciutto di Parma, or parma ham. Could I adapt the my high carb, gluten riddled recipe recipe? Would it work? These questions kept me up at night. First, my philosophy for low carb is not to make a thin imitation. While you’ll never convince me that pureed cauliflower is mashed potatoes, the dish is really quite good in its own right. And, more importantly, I don’t miss the potatoes. My goal for this dish was: good and you don’t miss the original. How can you go wrong with Prosciutto di Parma, sausage and oysters. Right? Let me caution: this stuffing is full bodied and full fat. It’s a go big or go home type stuffing. Everyone who has tried this stuffing in either high carb or low carb form have raved about it. Some people have declined to try it due to the ingredients. Chicken livers and oysters can lead some to take a pass. More for me, honestly. The technique I use is really rather unique. I was making the stuffing and decided to take a short cut. I didn’t want whole oysters or pieces of chicken livers in my stuffing for texture reasons, so I figured I would just chop them for a bit in the processor, because, well, isn’t that what it’s for? I quickly learned there’s no level of “a bit” that doesn’t turn the livers or oysters into liquid. So, instead of minced shellfish or livers, I had a lovely red puree. However, I wasn’t wasting my money by not using the livers or oysters, so I included them in the stuffing. Because these overtly odd ingredients didn’t appear in the stuffing, people were more inclined to try it. And, by extension, love it! Huzzah! I just got back from Williamsburg, so that celebratory phrase stays! So, dear reader, I am giving you my famous stuffing recipe. My kids cried that I was using a recipe from the secret family recipe book. But I will share this one. Kick the boxed stuffing habit and make your own stuffing. It will be miles better than anything from a box. You can make it ahead too! And, depending on the version below you choose, you can actually label this a vegetable side. You’ll get the joke when you read the ingredients. Note: Low carb/Gluten free version requires cooked cauliflower, see Cuban Rice and Beans for full prep instructions. 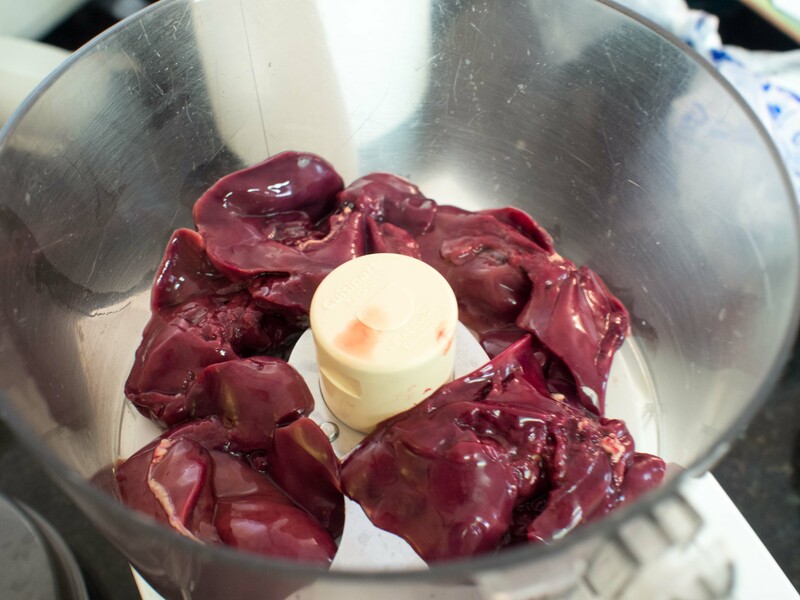 Place chicken livers and oysters in the container of the food processor and process thoroughly. Cover and set aside in the refrigerator. Heat fat over medium heat in a large skillet. 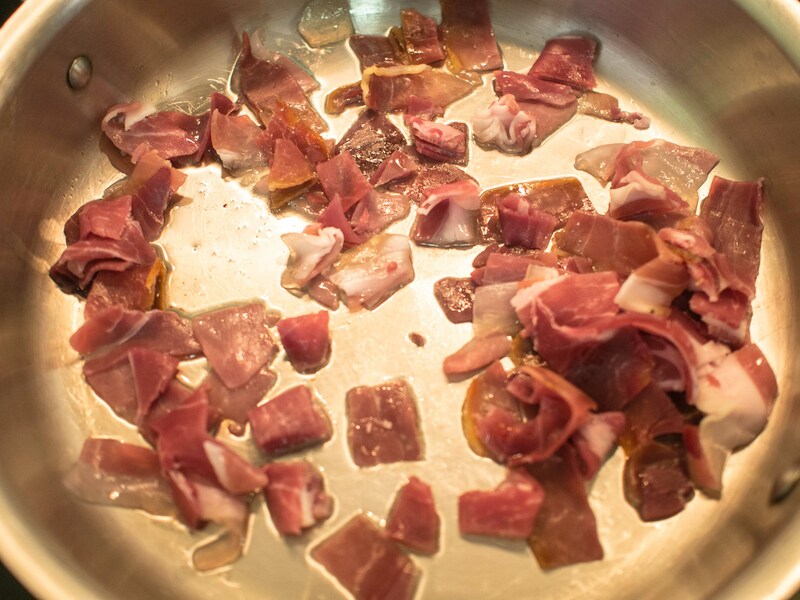 And prosciutto and sausage and cook until the sausage is cooked through and both are rendered of fat. Add the onions, celery and mushrooms and cook until the onions and celery are translucent and the mushrooms have lost some of their liquid. Add the garlic and saute until soft. Add the sage and liver mixture. Cook until the mixture is no longer reddish. Add the butter, cauliflower or bread crumbs, eggs and salt and pepper. Place in an oven dish, cover and refrigerate. To serve, heat in a 350 degree oven until the top is brown and the stuffing is warmed through. This entry was posted in Gluten Free, Holiday Recipe, Low(er) Carb, Vegetable Side and tagged dressing, Gluten Free, Low Carb, Prosciutto, Sage, sausage, Stuffing, thanksgiving on November 13, 2013 by dawn of food. Being a fairly low carb person, there are certain foods I desperately miss. Would I love a plate of French Fries? Yup. Pizza? You bet. Stuffing? Yes, a million times. Crackers with my cheese? Of course! Bun with my hamburger? Oy. Mashed Potatoes? Not really. I’m not a potato fan, unless they are completely fried crisp. Then, ok! I’m mostly in it for the crispy outside shell. Steak fries? Pass. My husband, on the other hand is part Irish and LOVES potatoes. He’s having to get extremely serious about being low carb because his lack of seriousness has had some health consequences. So, he reluctantly joins the low carb bandwagon. I had heard about fake mashed potatoes. But honestly, the thought of cauliflower really didn’t appeal to me. Sure, it’s beautiful when raw. That’s about where my affinity ends. I’ve used it as a rice substitute, but it’s pretty swamped with strong flavors and more there for filler. 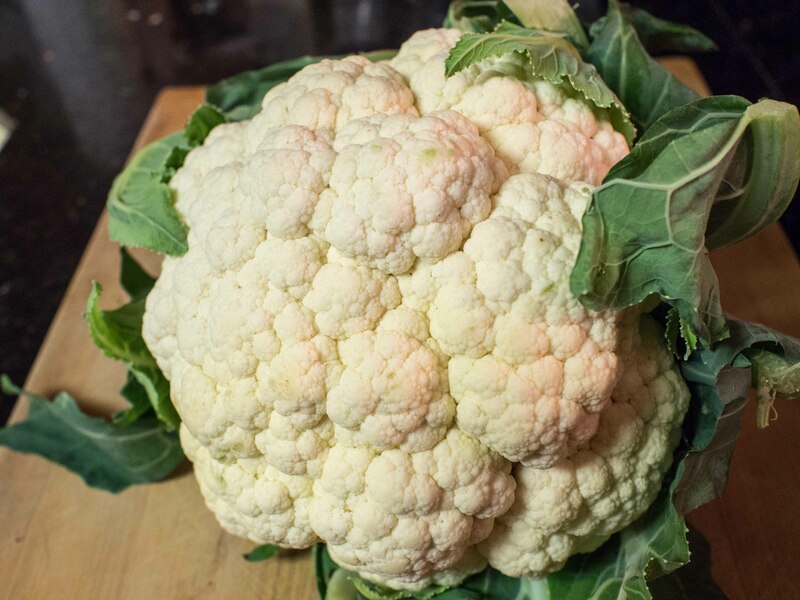 In this recipe, cauliflower is the star. The. Star. I tried a ton of recipes and some lacked the heft or texture of mashed potatoes. Some were just runny. Others worked better, but really didn’t take advantage of the blank canvas. I tried to up the flavor here and add really good texture as well. Cauliflower is wet. Very, very wet. And in this recipe we steam it, adding more water to the process. So, without something more, you’ll have a very thin mixture with just pureed cauliflower. I used a combination of cream cheese and butter to really give the dish more substance. I also could have roasted garlic and added it to the puree, but I liked the convenience of granulated garlic. It added flavor without any additional moisture. This recipe comes extremely close to garlic mashed potatoes. My kids ate it up until I told them it wasn’t mashed potatoes, then it became a pariah on the plate. But really, it stands on its own as a great dish. No need to fool anyone, just say it’s pureed cauliflower. Unless they are minors. Then it’s mashed potatoes. As an extra bonus, it’s mashed potatoes that are quicker and easier to make then real mashed potatoes! Your mileage my vary on this dish. I used 1 really large head of cauliflower. Steam cauliflower until soft. I used a steamer insert and placed it over boiling water and it took about 13 minutes. 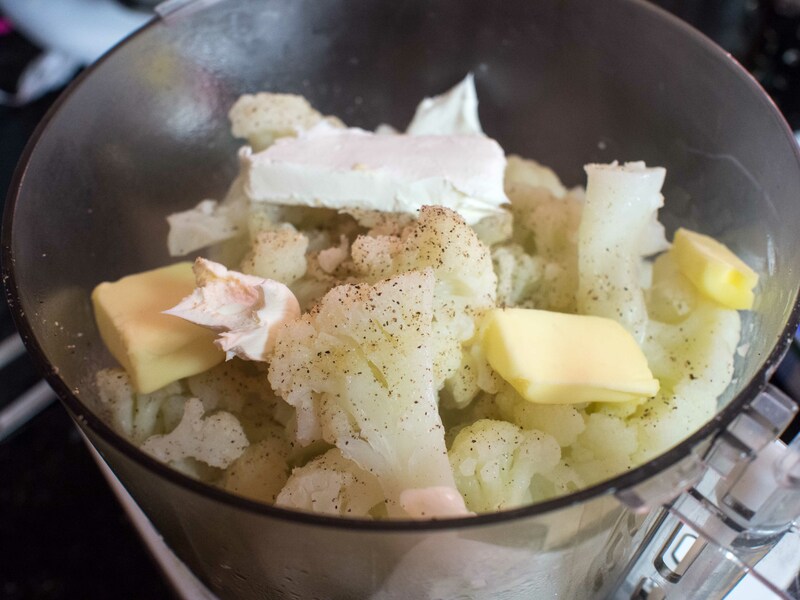 Place one third of the cauliflower into a food processor (if yours can take more, great, mine couldn’t). Add 1 tablespoon cream cheese, 1 tablespoon butter, and 1/4 teaspoon granulated garlic to the food processor. 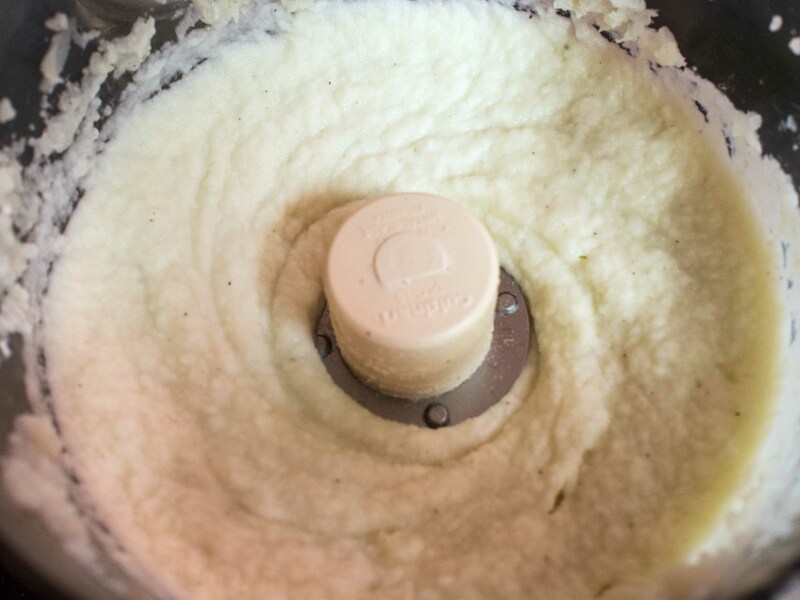 Puree until the consistency desired and there are no remaining chunks of cauliflower. Place in a serving bowl and cover. 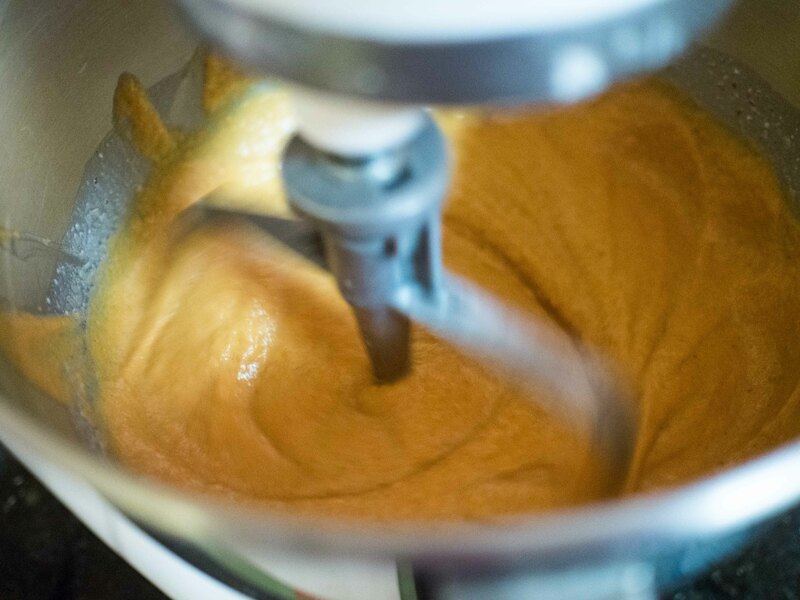 Repeat process until the cauliflower is all pureed. Salt and Pepper to taste and serve. 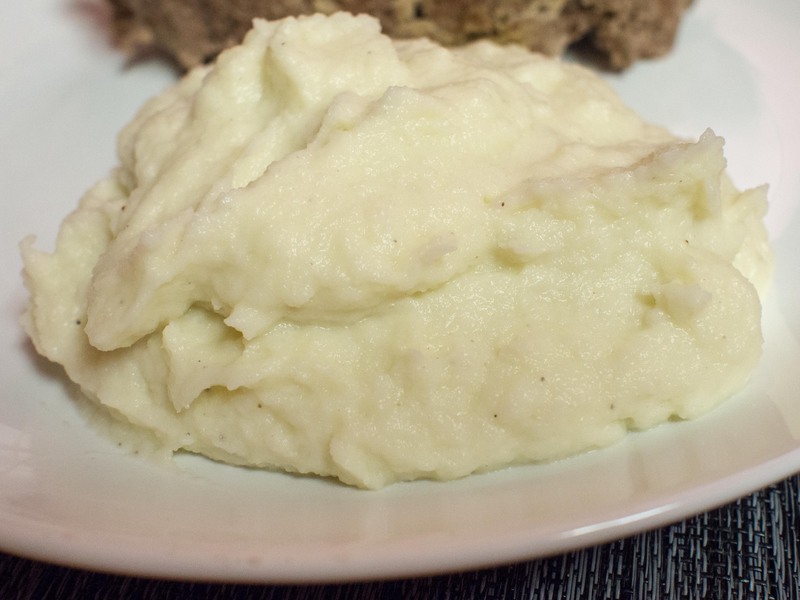 This entry was posted in Gluten Free, Low(er) Carb, Vegetable Side and tagged cauliflower, Cauliflower Mashed Potatoes, Cream cheese, granulated garlic, Low Carb, Mashed Potatoes, thanksgiving on November 3, 2013 by dawn of food.